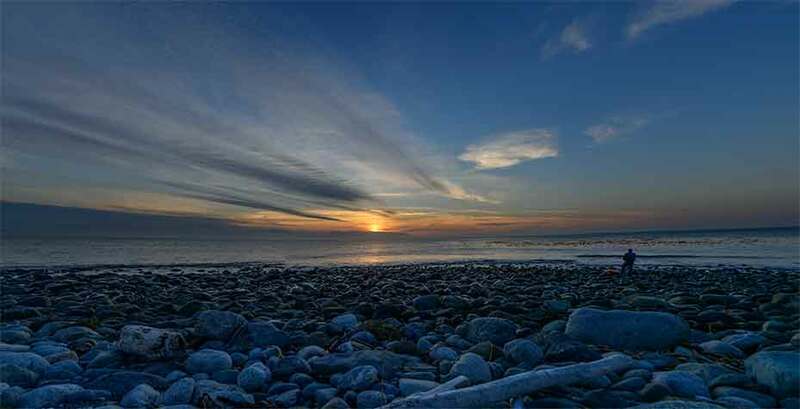 Our Best Beach This Month is the beach at Fort Ebey State Park. The three-mile long shoreline is great for hiking, fishing, wildlife and scenery. Somewhere about halfway up the west coast of Whidbey Island, the coastline shows its wild side. Water and wind buffet the land. There is nothing between the open ocean and this coast but the waters of Puget Sound. Trees permanently lean a bit inland as though always enduring the wind. I lived here for several years before exploring this beach. But, after doing so, I ended up returning several times over the span of a few weeks so that I could see it at different times of the day. From the Clinton ferry, take State Route 525 about 22.1 miles north until it joins State Route 20. Continue driving another 8.9 miles and turn left on Libbey Rd. Drive .9 miles to Hill Valley Dr. Drive .7 miles to Valley Dr. Drive .3 miles and take a slight right to Fort Ebey Rd. After entering the park, turn right onto Fort Ebey Rd. Drive .4 miles to the parking on the left. 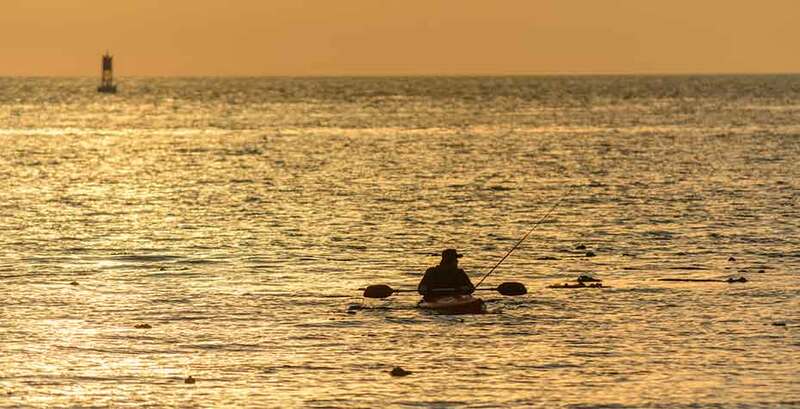 A kayaker heading out for some fishing. The beach is about three miles long, but steep bluffs limit access. The easiest way is to just follow the park signs to a small parking lot. From there, it’s a short walk to reach the beach. The downhill slope is it bit steep in places, but most people will have no trouble. The wild side is at first a bit subtle, at least on days without much wind. The trees look a bit more “frazzled,” the waves are larger and with more attitude, and somehow nature just feels a bit more full of herself. I wonder what the beach is like when a winter storm stirs things up. This area near the parking lot is fairly easy to walk with gravel and small stones making for relatively easy footing. 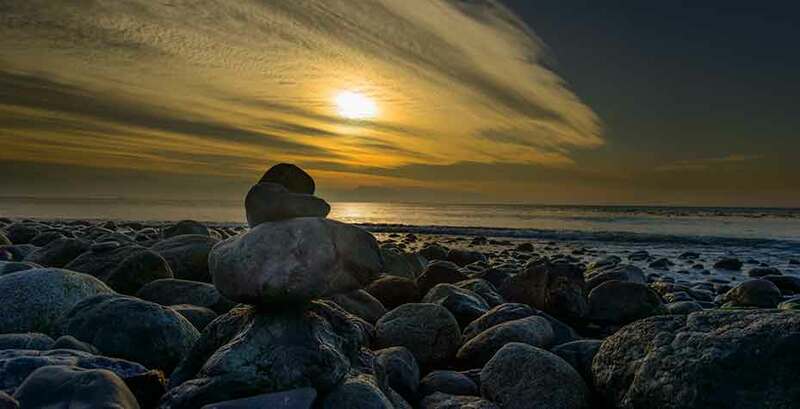 A pile of rocks lend an otherworldly look to the beach at Partridge Point. However, further south at a spot called Point Partridge, the beach is strewn with boulders and you can see how wind and water are eroding parts of the bluff. 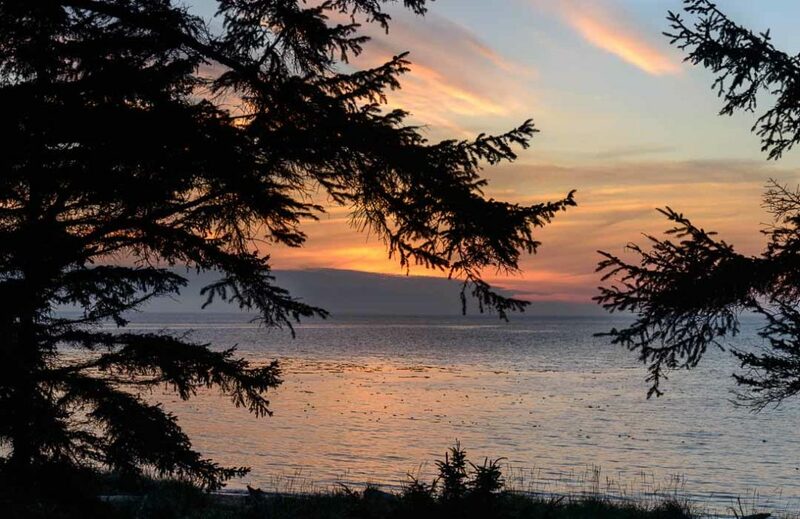 Follow the narrow footpath at the base of the bluff around the point for an expansive view of Admiralty Inlet. As I walked this stretch there was a kayaker a few hundred feet from shore. A buoy clanged further out. Someone had stacked the smaller rocks and you could see the kelp beds sticking just above the surface. I was among several who came to watch the sun set. One group was armed with coffee while their dog catalogued beach smells. I was momentarily startled when a couple and their dog came up behind me, evidently hiking the entire length of the beach. As the sun went down, I remembered the beach’s wild side and chose to head back before it got too dark. Near my car I paused to see the wind-worn trees and how they framed the clouds. It was a peaceful end to a visit to Whidbey Island’s wild side.